Protection water repellant hybrid is ideal for the treatment of coatings, facilities, fences, doors and windows and exterior floors in wood. Greater resistance to weather compared to traditional oils. Fast application and drying . New hybrid system of water-repellent protection with low thickness for the treatment antidegrado of wooden artifacts located outside. Does not create spellicolamenti nor esfoliazioni. 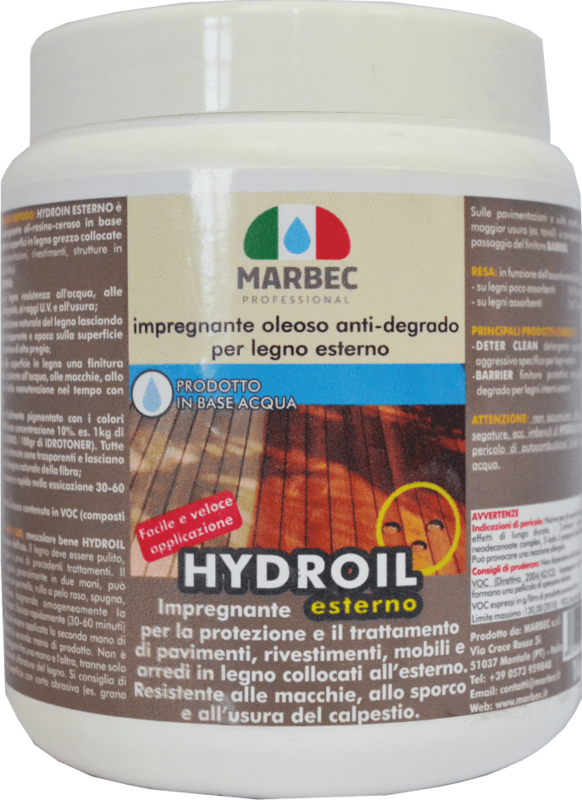 The protection obtained with ORC-impregnating material can be easily stored and renewed in time (periodic maintenance) by the application of a new passage of ORC-impregnated outside and without the need for onerous recoveries (es. Discard the wooden surface). Mix well ORC-impregnated before use. The wood must be clean, well sanded and free of old residual films. The product can be applied with a brush, sponge homogeneously by wetting the surface of the wood. It dries quickly (30-60 min.) and immediately after can be applied to the second coat of the product. In the case that the application of the product takes place the next day or on surfaces are very sunny (where it has already developed the hydrophobic effect), it is advisable to spread the product by wiping the surface with a soft cloth or spandicera fleece to facilitate the unfolding. It is not necessary to abrade between coats, except that to eliminate any sfibrature of wood. Rinse the equipment with water. on absorbent timber 1 lt / 7-10 mq.